Breaks of 10 present the first installment of their new, monthly, music event named ‘Sessions’, with a DJ set from Leeds based disco/house producer Picture House, who will be playing a 100% vinyl set of disco, from classics to modern day anthems. Sessions will host a different DJ or producer each month, and allows them the freedom to stray away from their regular tune selection and play ‘whatever they want’, however unconventional that may be. The monthly event will take place at Brick Lane’s 93 Feet East, and available for download as a podcast after the event. 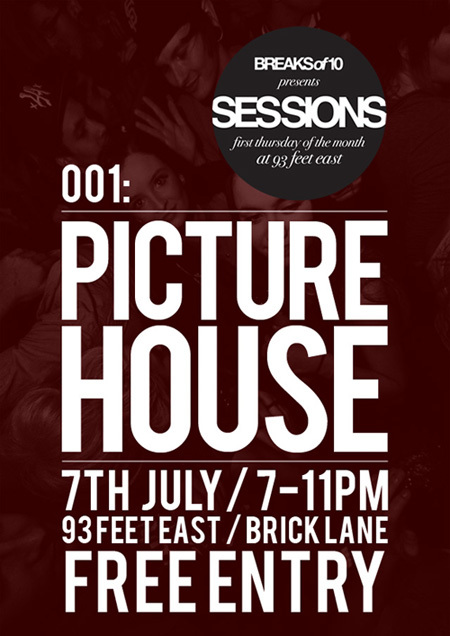 001 takes place this Thursday (July 7th) from 7-11pm, and will continue on the first Thursday of every month following. More info on the flyer above and at Breaks of 10.